Every winter my skin gets dry and cracks, mostly on my hands. Some seasons it can be outright painful and even cause bleeding. The very last thing that I would ever do during these times is use a hand sanitizer that’s made mostly of alcohol. That's a treat you only subject yourself to once! I need to shake a lot of hands these days so I need healthy AND cleans hands, so what do I do? When I learned I had the opportunity to try Veripur's Hand Sanitizer and Moisturizer I jumped at the chance. The idea of moisturizing and disinfecting my hands at the same time was very appealing. So how does Veripur work? Veripur does not use any alcohol to disinfect so there is no pain or drying out of the skin. Although it is easy for me to tell how effective the moisturizer is (it's excellent), it is impossible for me to rate the disinfecting properties. 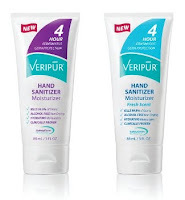 Veripur claims to kill 99.9% of common germs for up to 4 hours with their SafetyDerm technology, but even if Veripur kills just some of the germs, it is far better than the alternative of using regular hand sanitizer with cracked skin. Veripur is an excellent product and I highly recommend it. Clean and moist skin, how can you go wrong? Beginning February 2011, Veripur Fresh Scent and Veripur Unscented can be purchased in a 3oz tube or a 13oz pump at your local Walgreens pharmacy, as well as online from sites such as Walgreens.com and Amazon.com . To learn more about Veripur, visit Veripur.com or Veripur on Facebook and Twitter.